My niece Adhira Waghmare(5 years old, A+,female ) is suffering with blood cancer-type ALL.She was being treated in Wadia Hospital,Mumbai from last 18 months. During her treatment ,Cancer recurred. Now Bone marrow transplant is the only option after one month of prerequisite of reinduction treatment which last for 4-6 weeks. The reinduction and Bone marrow transplant cost approximately 30 lacs provided no complications and infections. We are hoping for best results for our child which is strengthened by meetings some of the successful cases under Revathi Raj at Apollo Cancer Hospital, Chennai. My elder brother- father of patient- Suraj RAMRAO WAGHMARE is an LIC agent and has no fixed income. Mother of patient is housewife. We are basically from Ballarpur/Ballarshah district chandrapur.The total treatment cost is too big so looking for financial help or loan. Any kind of help will further strengthen our hope and confidence that we can save our child. 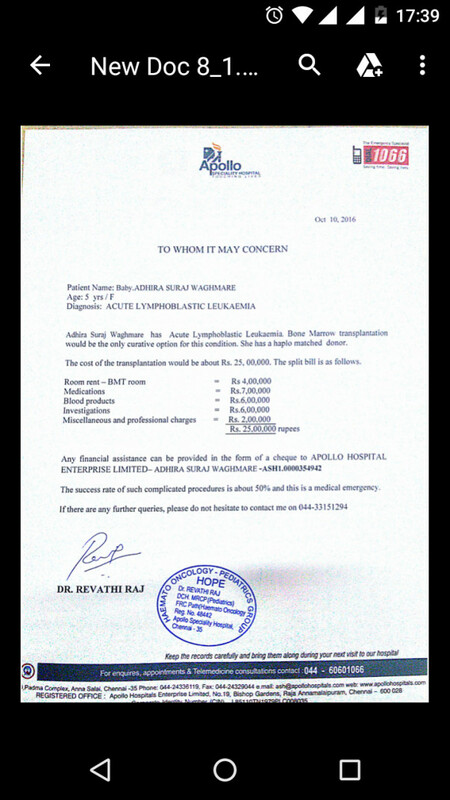 If donation is directly being credited to Apollo hospital then please let me know transaction reference number. Looking for positive response from you. 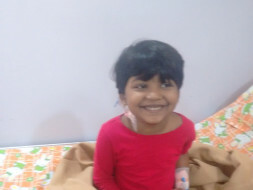 Update about Adhira's ongoing treatment : Next phase -Conditioning- for BMT has started . The conditoning will last for 2-3 weeks . Adhira will be closely monitored and simultaneously the donor will be prepared for transplant. If everything goes fine , actual BMT will be done in first or 2nd week of January-2017. Dear fnds - Positive news . Most critical MRD report of Adhira(Chioo) is negative which enables the BMT process and increases the success rate of Bone Marrow Transplant (BMT) . Thanks a lot for your support ,wishes ,prayers and help !! I know adhira is not alone ,we all are with her and we all are fighting with Blood cancer with her .I have strong belief if we all are together ...we all will win . Battle on ..!! Thanks for all your wishes , prayers and support so far !! Below are are some details for your information . Bone Marrow Transplant is done when best HLA match is found . HLA matching is done to get the best match of Bone Marrow . Closer the match best is OS(overall survival) of patient . Based on the match %, the Bone Marrow Transplant (BMT) is done . If the patient has sibling then most of the time HLA matches to 100% (10/10).It is called MSD (Matched Sibling Donor). Adhira does not have sibling . In this scenario, 2 options are available based on matching % : 1) mmRD - MisMatched Related Donor or 2) URD (UnRelated Donor ). Parents falls under mmRD . HLA matching of Adhira was done with parents and its matches 5/10 and 7/10 for mother and father resp. so Best match us Father's HLA . Unfortunately ,URD 10/10 matching was not found in diff HLA registry checked in India by Apollo hospital, Chennaii. Sometime URD matches 10/10. 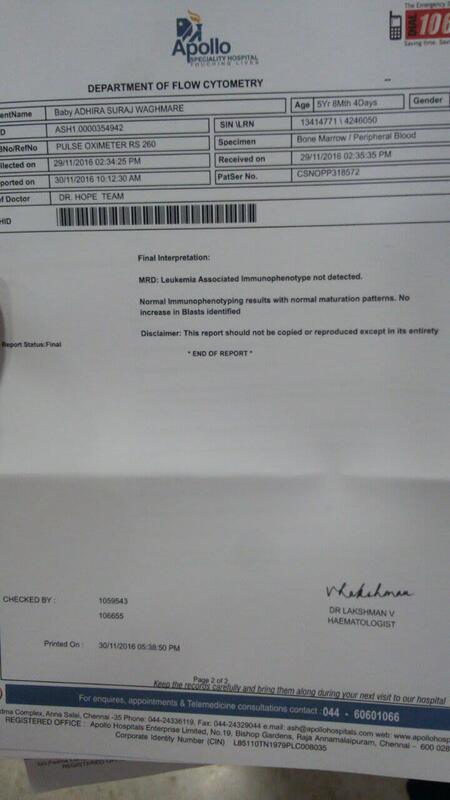 So BMT will be done with bone marrow from father . Matching is 7/10 . Morever , the prerequisite for BMT is absence of Minimal residual disease (MRD) . in the patient during treatment, or after treatment when the patient is in remission (no symptoms or signs of disease). It is the major cause of relapse in cancer and leukemia. Once MRD comes negative , we will be in good position to go ahead with BMT .THis test will be done in last week of November2016 . This entire process will take appr 6 months if everything goes and without any complications. Lets hope every test and its results goes our way .Thanks for your continued support !! I will keep on updating the status of treatment . I know , Cancer cannot defeat the hope and positivity of these many people. It cannot overcome the courage angel ADHIRA. Though the battle is arduous , We all will win !! !